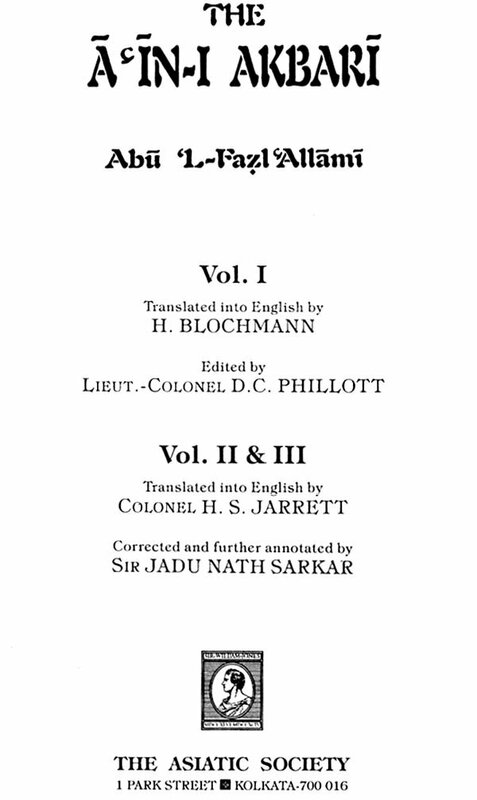 Colonel Jarrett’s English translation of the Ain-i-Akbari Vol. III. Has been long our to print though there is always a demand for it and second hand copies are now selling at fancy prices. But a mere reprint of his edition would not do justice to the present state of Oriental scholarship and would naturally disappoint the modern reader. Jarrett began the preparation of his translation about 1890 that is fully 57 years ago. Among the authorities he most frequently quotes in the notes are D;’Herbelont’s des Mongols (1834) De Guignes’s Histoire general des Huns (1756) Max Mullers’ History of Sanskrit Literature (1859) Davies’s Hindu philosophy Colebrooke’s Essays (1805-37) and Elphinstone History of India (1841). Since then a complete revolution in our knowledge of these branches of orientology has been effected by the publication of Hastings Encyclopedia of religion and ethics the encyclopedia of Islam the Grundriss (Inod Aryan ed. By Buhler and Iranian by Geiger and Kuhn). 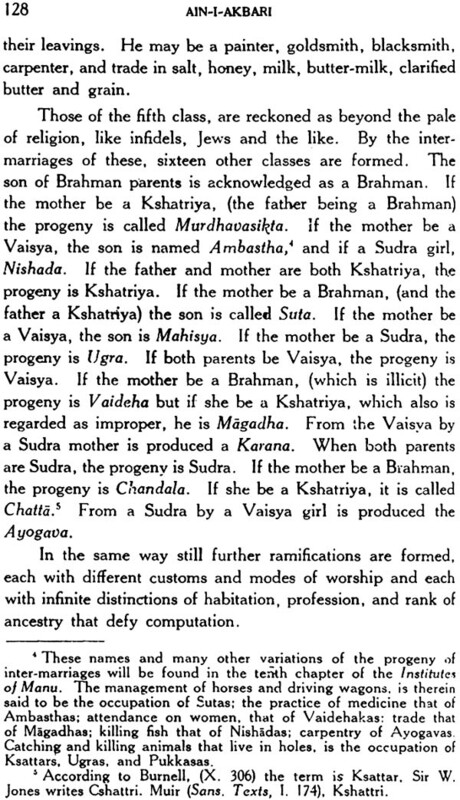 Winternitz’s History of Sanskrit Literature and the histories of Hindu Philosophy by Radhakrishan and S.N. 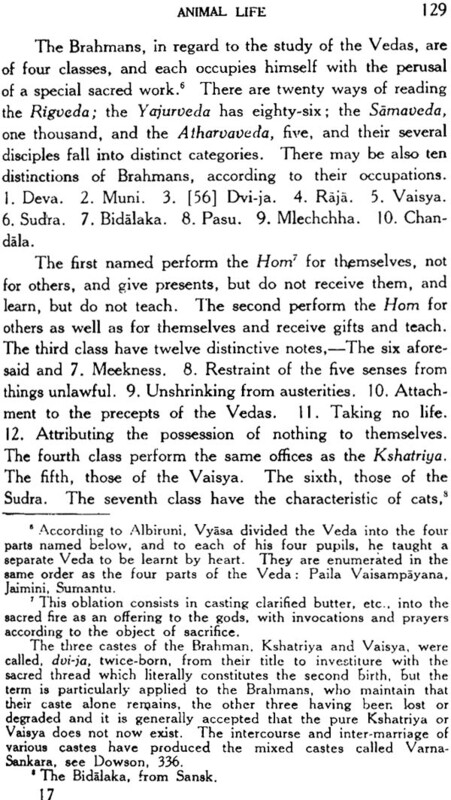 Das Gupta besides many learned special monographs. 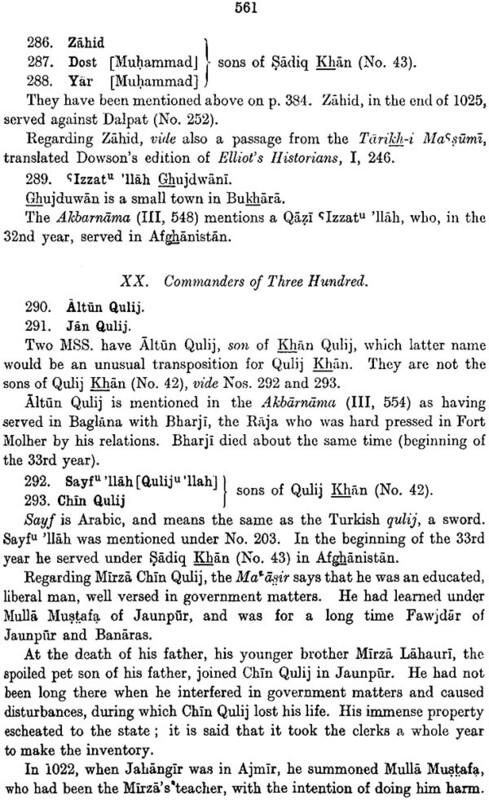 In oriental geography the work of the modern French and German explores in Arabia Persian Syria and Africa is except for one or two of the earliest published entirely unrepresented in Jarrett’s notes and how valuable their information is we can judge by contrasting his remarks on any place name with the account of it given in the Encyclopedia of Islam. Thus the first task of an editor of Jarrett’s translation is to modernize his notes and elucidations by sweeping away his heaps of dead leaves. My second aim has been to lighten the burden of his notes many of which are not only obsolete in information but prolix to the extent of superfluity. 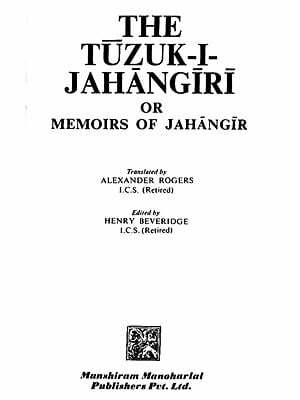 In it I hold a mistake of the translator’s duty to try to make a modern reader get all his ideas of Hindu philosophy literature, science and mythology or Islamic hagiography topography and science from an English translation of Abul Fazl’s Ain-I-Akbari. Abut Fad’s original work was meant to serve as a handy encyclopedia for readers of Persian who knew no other language and had no access to standard works even in the Persian and Arabic languages. The modern reader, versed in English. 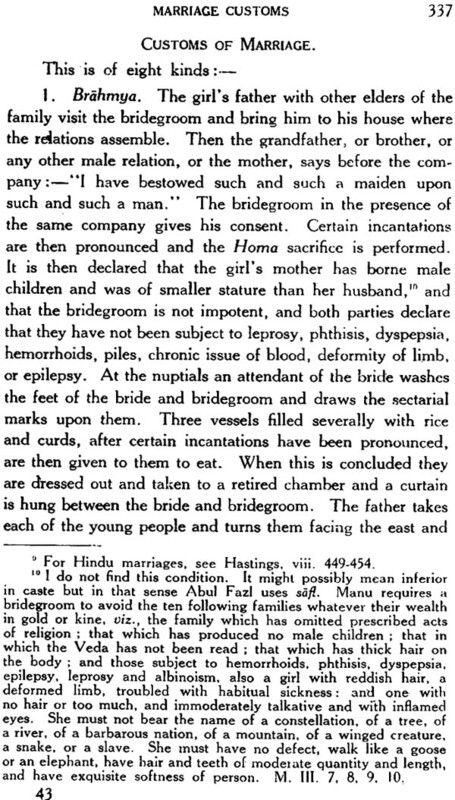 will find very much fuller and far more accurate information on these subjects in the voluminous encyclopedias and standard monographs in the English language which have been published in our own times. The law of copyright would probably not permit me to transfer column after column of matter from these modern works to my footnotes, as Jarrett has done with the works of D’Herbelot and other antiquated sources. 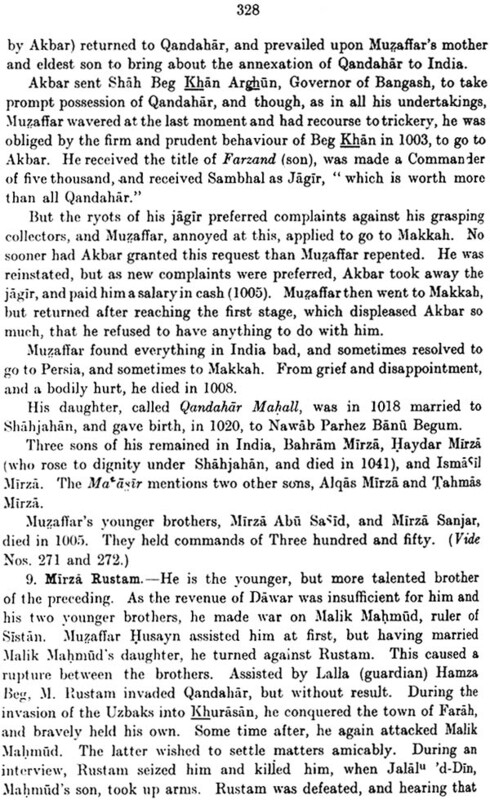 I have, therefore, totally omitted his lengthy quotations from these authors and given instead exact page references to the Encyclopedia of Islam, the Encyclopedia of Religion and Ethics, and other modern authorities, which are available to serious students in the libraries of learned societies and Universities. I have also economized space and saved the reader from frequent unnecessary interruptions by the omission of the notes on the emendations of the printed Persian text made by the translator. The editing of many of the volumes in the Persian and Arabia section of the Bibliotheca Indica series, was not done with the necessary care and accuracy, as learned circles have found to their vexation. Therefore all obvious misprints and wrong readings have been silently corrected in this new edition of the translation and hundreds of notes of the first edition under this head eliminated. 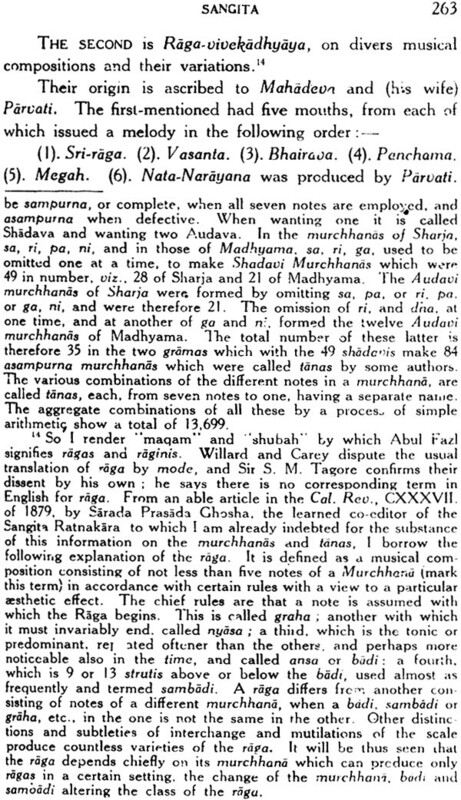 For example, on p. 68, we had “Lakhnauti, in Bengal” followed by the translator’s note “The text has Nek for Bang.” Such errors, due to the careless placing of dots (nuqta) by copyists or proof-readers, are too obvious to raise any doubt this note has been excluded by me as unnecessary. 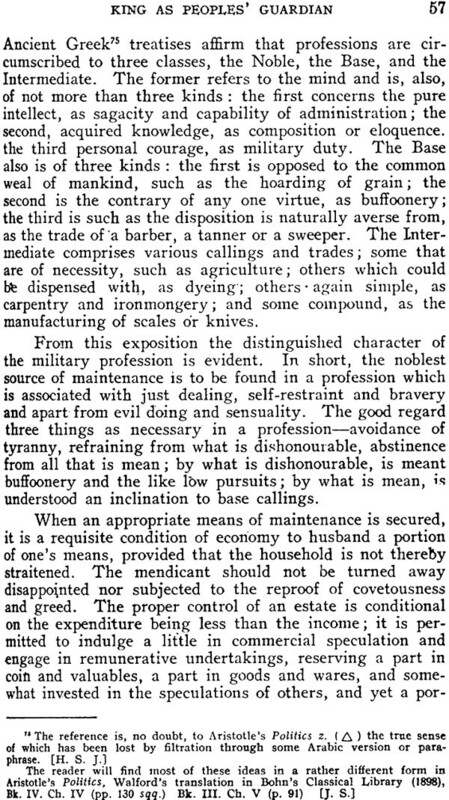 But in every really important case, where the emendation of the text raises a vital question or leaves room for difference of opinion, the notice of such emendation has been retained in the new edition. Abut Fazl’s copyists or their successors made many errors and omissions in the matter of the latitude and longitude of places. 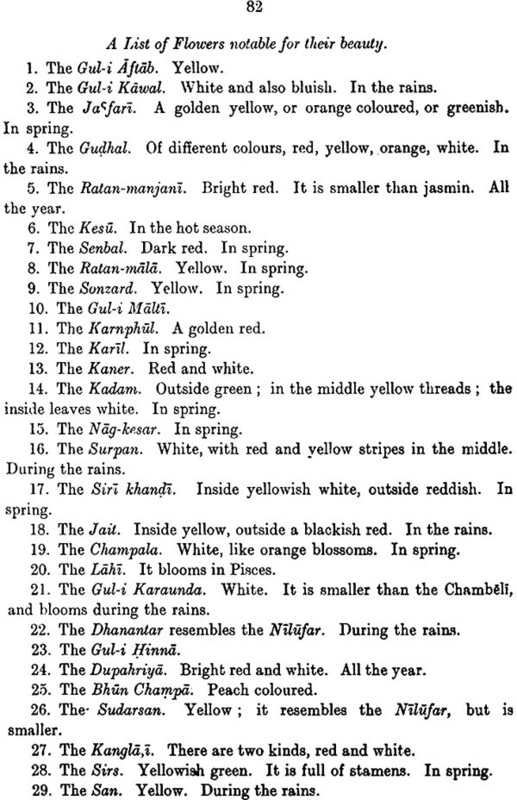 all of which were corrected with meticulous care by Jarrett I have retained all his corrections but dropped his references to the errors In the Persian text. On p. 104. Jarrett himself admits in despair. 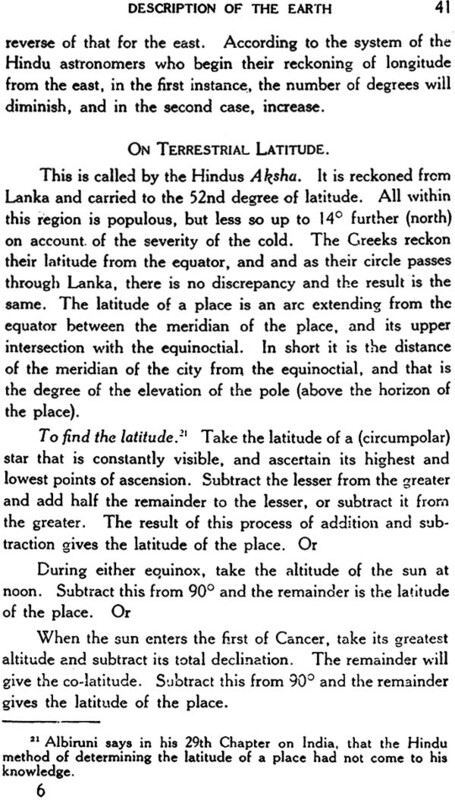 The whole (geographical) list of Abul Fad is the work of a scribe, not of a geographer”. 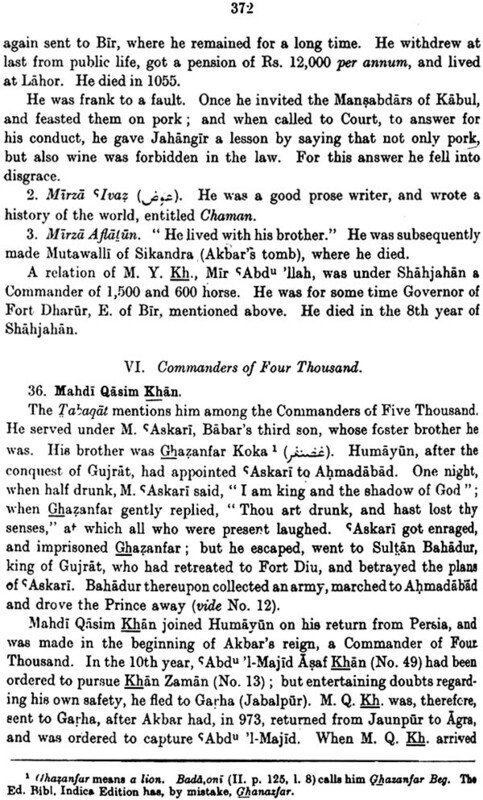 Abul Fazl’s professed aim in writing the Ain-i-Akbari was to give the Persian reading world of his day a clear idea of the literature philosophy arts and sciences of the Hindus and the saints and heroes of India but he also tried to adorn the subject by giving a brief account of the Muslim world both in and out of India by means of a short compilation from well known Arabic and Persian authorities composed outside India. The portions of the ain which serve the second purpose make no claim to origin ality and have no historical purpose make no claim to originality and have no historical value their accuracy is vitiated by Abul Fazl’s possession of very poor manuscripts of the Arabic works used by him. It is therefore not worth the while to note every one of the mistakes he made for his reason. 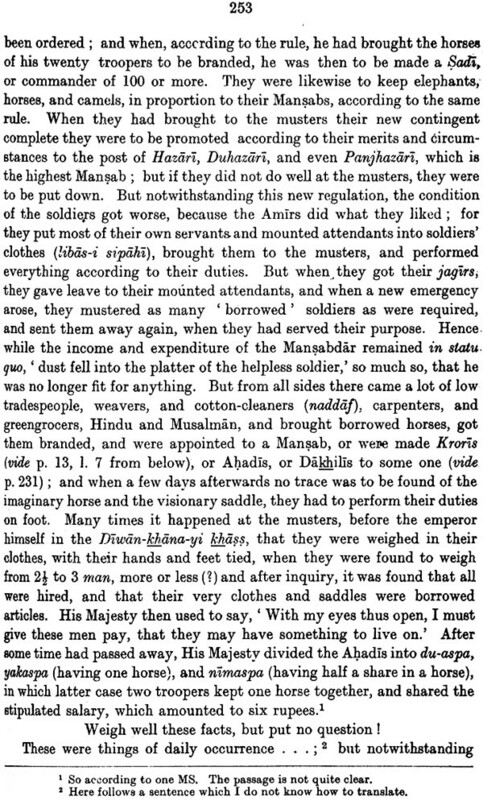 No remark made above should be taken to cast any reflection on Col. Jarrett’s scholarship or belittle the stupendous task that he accomplished with immense industry and deep and varied learning combining the wisdom of the East and the West in translating and annotating the Ain-i-Akbari volumes II and III He had to translate a very difficult book from a few badly transcribed and unhelpful texts and to throw light on a wide range of technical subjects currents in the middle ages but now obscure. 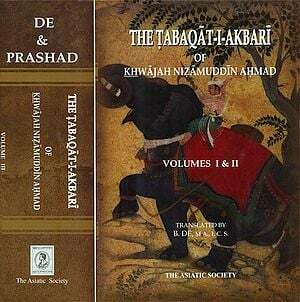 The A-in-I Akbari is the third volume of the Akbarnama by Shaykh Abu l-Fazl and is by far the greatest work in the whole series of Muhammadan histories of India. 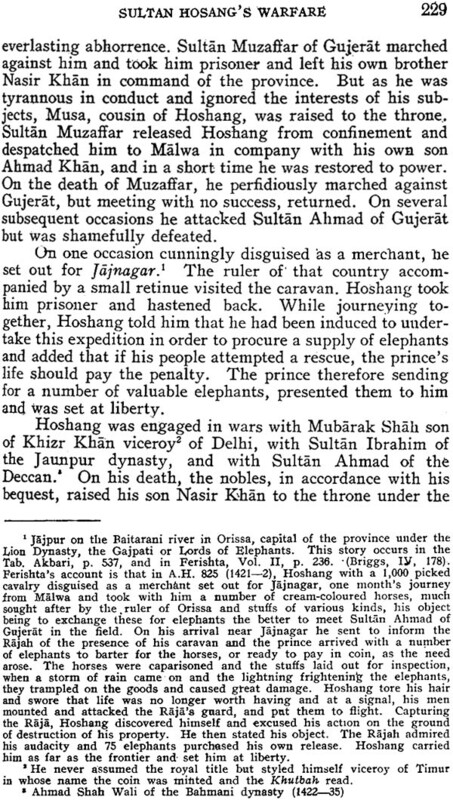 The first volume of this gigantic work contains the history of Timur’s family as far as it is of interest for the Indian reader and the reigns of Babar the Sur kings and Humayun whilst the second volume is devoted to the detailed history of nearly forty six year of the reign of the great emperor. 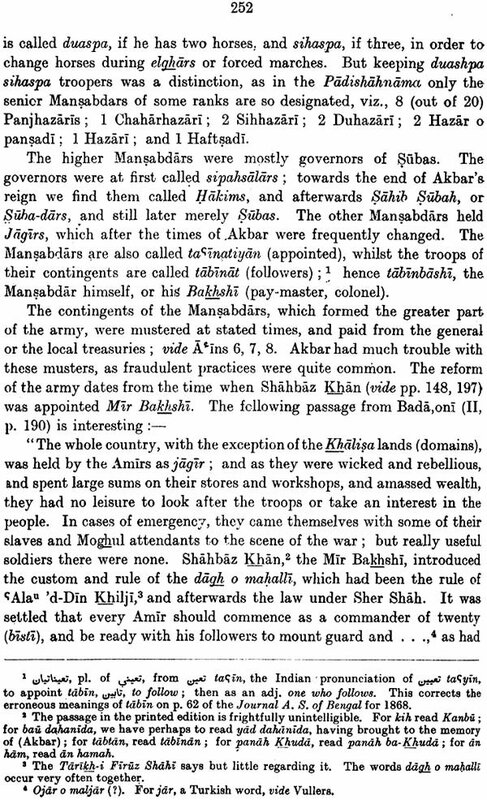 The concluding volume the A-in-I Akbari contains that information regarding Akbar’s reign which though not strictly historical is yet essential to a correct understanding of the times and embodies therefore those facts for which in modern times we would turn to administration reports statistical compilations or Gazetteers. 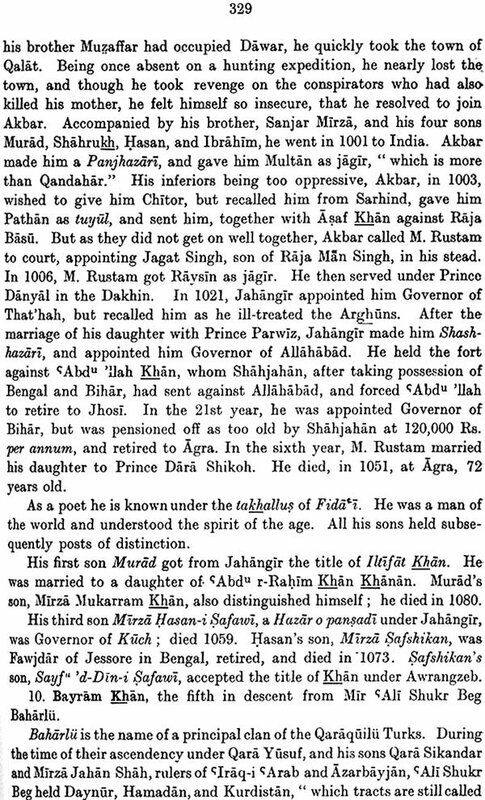 It contains the of Akbar and is in fact the administration Report and statistical return of his government as it was about A.D. 1590. The contents therefore of the A in are naturally varied and detailed. 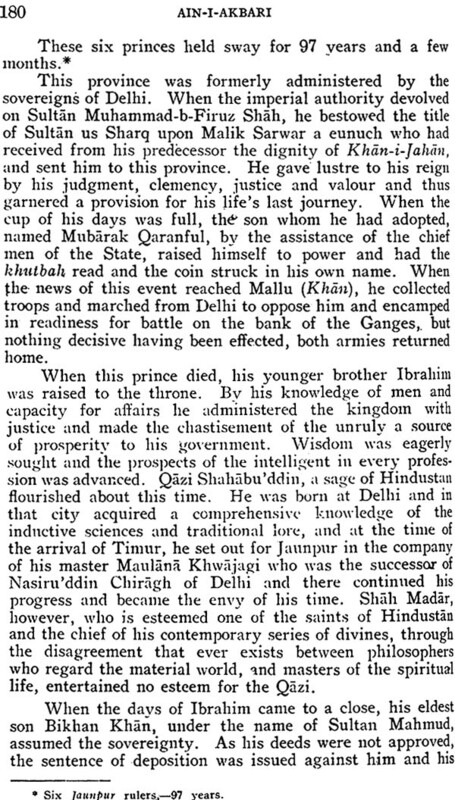 The first of its five books treats of Akbar’s household and court and of the emperor himself the soul of every department who looks upon the performance of his duties as an act of divine worship and who enters into the details of government in order to create a harmonious whole. 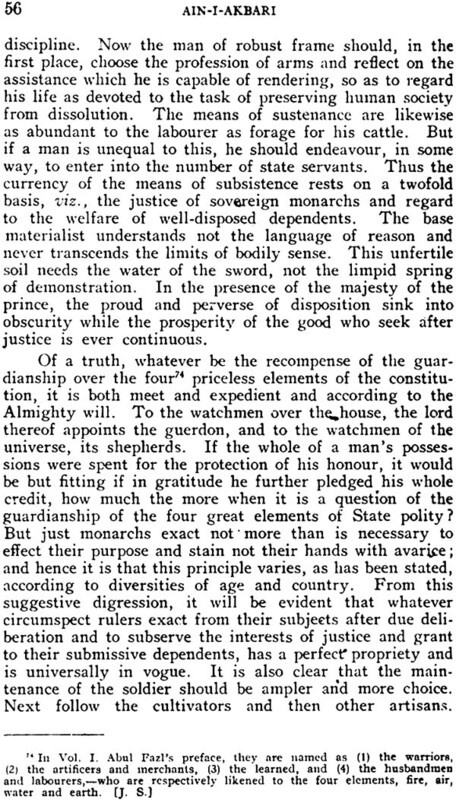 Vouchsafed as king with a peculiar light from on light from on high his person is prominently put forward as the guide of the people in all matters temporal and spiritual in whose character and temper the governed find that rest and peace which no constitution can give and in whom as the author of a new and advanced creed the dust of in toleration is for ever allayed. 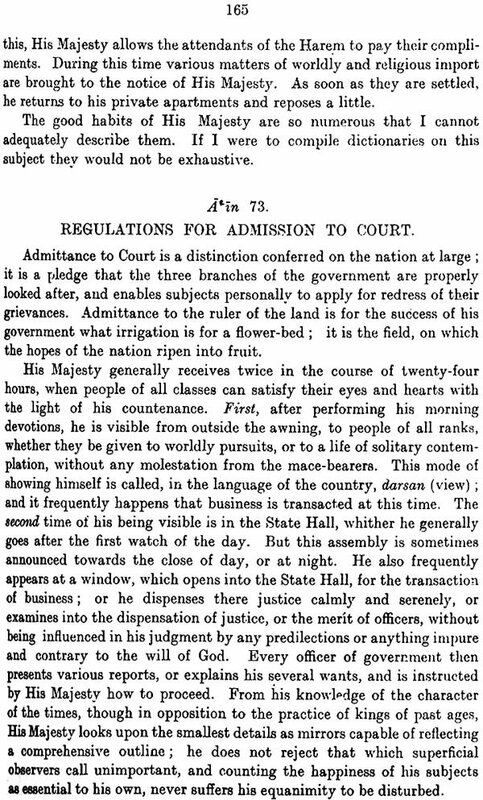 The second book treats of the servants of the throne the military and civil services and the attendants at court who literary genius or musical skill receives a luster form the encouragement of the emperor and who in their turn reflect a brilliant light on the government. The third book is entirely devoted to regulations for the judicial and executive departments the establishment of a new and more practical era the survey of the land the tribal divisions and the rent roll of the great finance minister whose name has become proverbial in India. 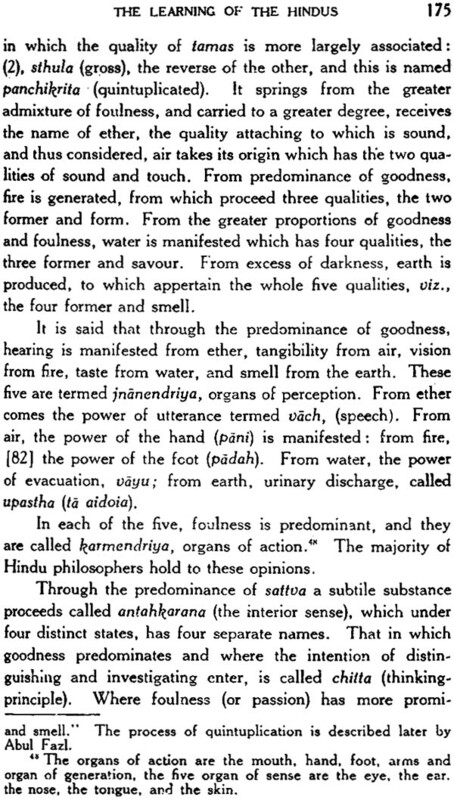 The fourth book treats of the social condition and literary activity especially in philosophy and law of the Hindus who form the bulk of the population and in whose political advancement the emperor saw the guarantee of the stability of his realm. There are also a few chapters on the foreign invaders of India on distinguished travelers and on Muhammadan saints and the sects to which they respectively belong. The fifth book contains the more sentences and epigrammatical sayings observations and rules of wisdom of the emperor which Abu I –Fazl has gathered as the disciple gathers the sayings of the master. 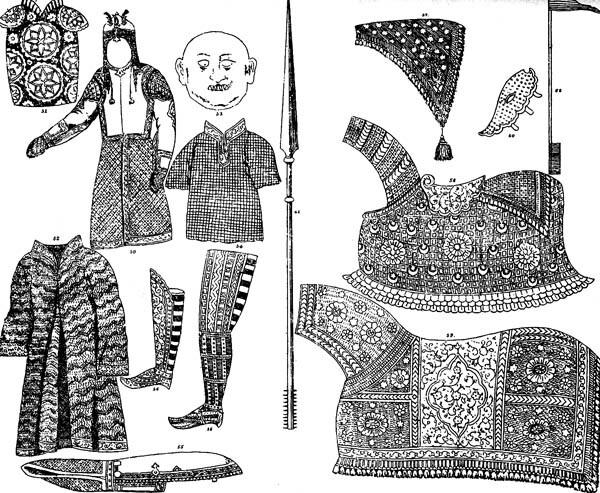 In the A-in therefore we have a picture of Akbar’s government in its several departments and of its relations to the different ranks and mixed races of his subjects. 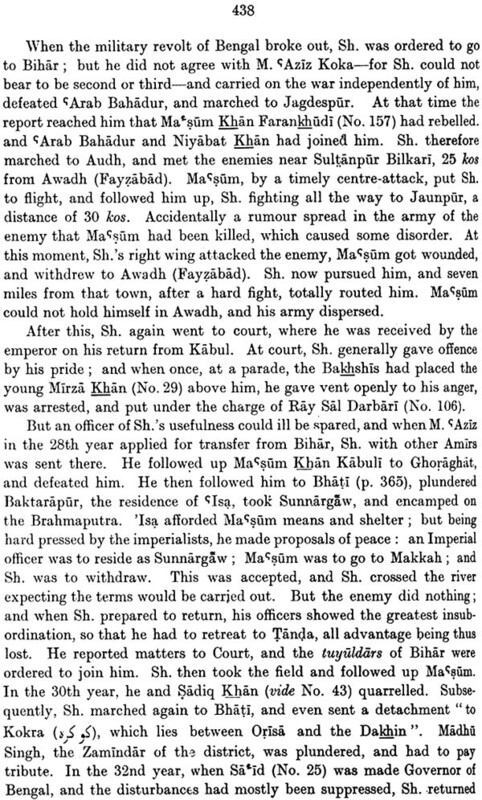 Whilst in most Muhammadan histories we hear of the endless turmoil of war and dynastical changes and are only reminded of the existence of a people when authors make a passing allusion to famines and similar calamities we have in the A in the governed classes brought to the foreground men live and move before us and the great questions of the times axioms then believed in an principles then followed phantoms then chased after ideas then prevailing and successes then obtained are placed before our eyes in truthful and therefore vivid colors. 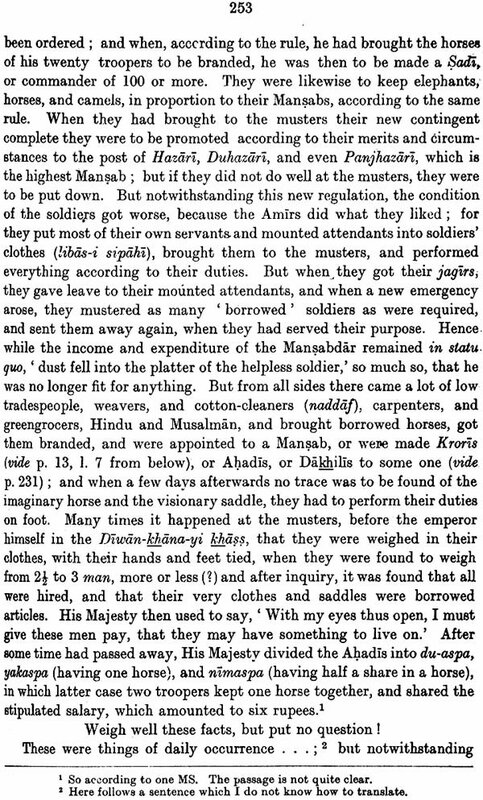 It is for this reason that the A in stands so unique among Muhammadan histories of India and we need not wonder that long before curious eyes turned to other native sources of history and systematically examined their contents the A in was laid under contribution Le Pere tieffentaller in 1776 published in his description geographique de l Indostan long extracts from the rentroll given in the third book Chief Sarishtadar grant used it largely for his report on Indian finances and as early as 1783 Francis Gladwin a thorough oriental scholar dedicated to Warren Hastings his Ayeen Akberi of which in 1800 he issued a printed edition in London. In his translation Gladwin has given the greater part of the first book more than one half of the second and third books and about one fourth of the Fourth Book and although in modern times inaccuracies have been discovered in the portions translated by him Chiefly due no doubt to the fact that he translated by him chiefly due no doubt to the fact that he translated from MSS in every way a difficult undertaking his translation has always occupied a deservedly high place and it may confidently be asserted that no similar work has for the lat seventy years been so extensively quoted as his. The magnitude of the task of translating the A in form uncollated MSS will especially become apparent when we remember that even in the opinion of native writers its style is not intelligible to the generality of readers without great difficulty. But it is not merely the varied information of the A in that renders the book so valuable but also the trustworthiness of the author himself Abu l-Fazl’s high official position gave him access to any document he wished to consult and his long career and training in various departments of the state and his marvelous powers of expression fitted him eminently for the composition of a work like the Akbarnamah and the A’in. 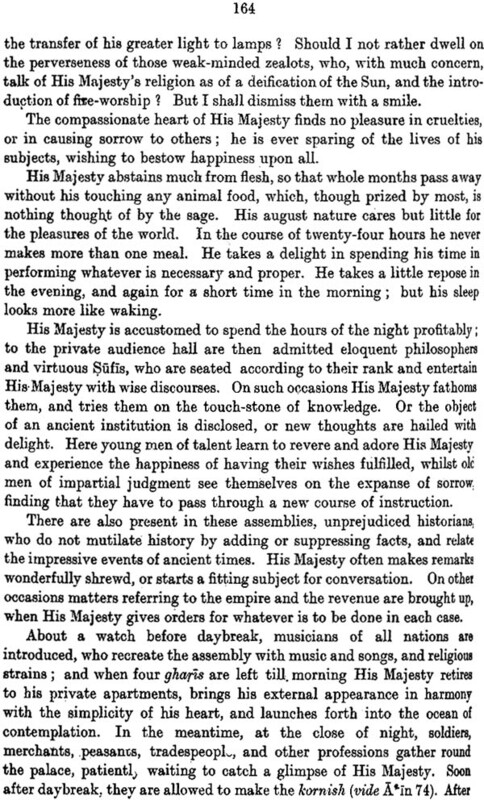 his love of truth and his correctness of information are apparent on every page of the book which he wished to leave to future ages as a memorial of the great Emperor and as a guide for inquiring minds and his wishes for the stability of the throne and the welfare of the people his principles of toleration his noble sentiments on the rights of man the total absence of personal grievances and of expressions of ill will towards encompassing enemies show that the expanse of his large heart stretched to the clear offing of sterling wisdom Abu l-Fazl has far too often been accused by European writers of flattery and even of willful concealment of facts damaging to the reputation of this master. 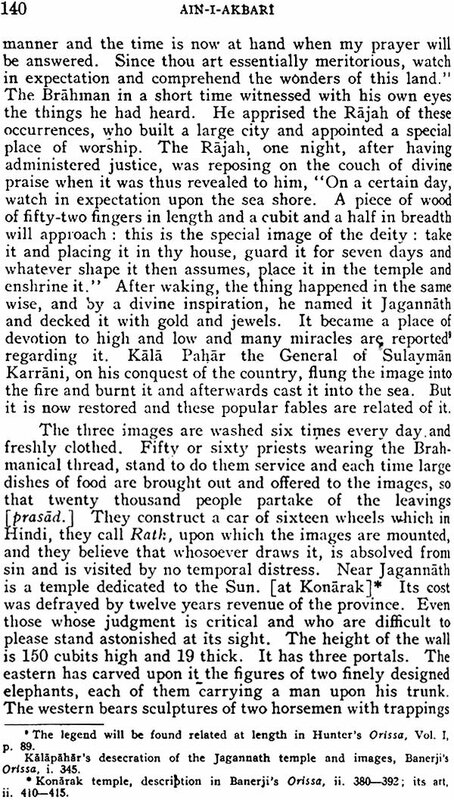 A study though perhaps not a hasty perusal of the akbarnamah will show that the charge is absolutely unfounded and if we compare his works is with other historical productions of the East we shall find that while he praises he does so infinitely less and with much more grace and dignity than any other Indian historian or poet. 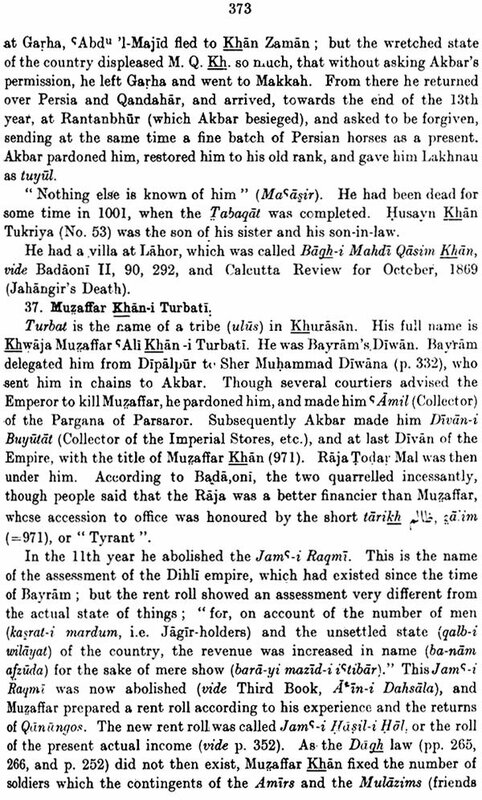 No native writer has ever accused him of flattery and if we bear in mind that all Eastern works on ethics recommend unconditional assent to the opinion of the kind whether correct or absurd as the duty of man and that the whole poetry of the East is a rank mass of flattery at the side of which modern encomiums look like withered leaves we may pardon Abu l-Fazl when he praises because he finds a true hero. The issue of the several fascicule of this translation has extended over a longer time than I at first expected the simultaneous publication of my edition of the Persian text from which the translation is made the geographical difficulties of the third book the translation from various Muhammadan historians and works on the history of literature have rendered the progress of the work unavoidably slow. 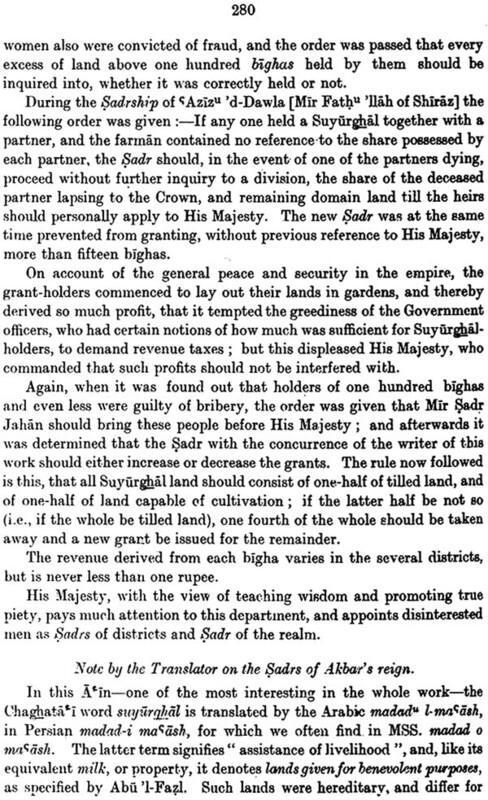 I am deeply indebted to the council of the philological committee of the Asiatic Society of Bengal for placing at my disposal a full critical apparatus of the A in and entrusting me with the edition of the text for which the Indian government had most liberally sanctioned the sum of five thousand Rupees. My grateful acknowledgements are also due to Dr. Thomas Oldham Superintendent of the Geological Survey of India and late president of the Asiatic Society for valuable advice and ever ready assistance in the execution of the work and to Col. H Yuel, C.B. and to H. Roberts Esqu of the doveton college for useful hints and corrections. I have though it advisable to issued the first volume with a few additional notes and two indexes one of persons and things and the other of geographical names without waiting for the completion of the whole work. I have thus had an opportunity of correcting some of the errors and inconsistencies in the spelling of names and supplying other deficiencies. That defects will still be found not withstanding my endeavors to remove them none of my readers and cities can be more sensible than I myself. 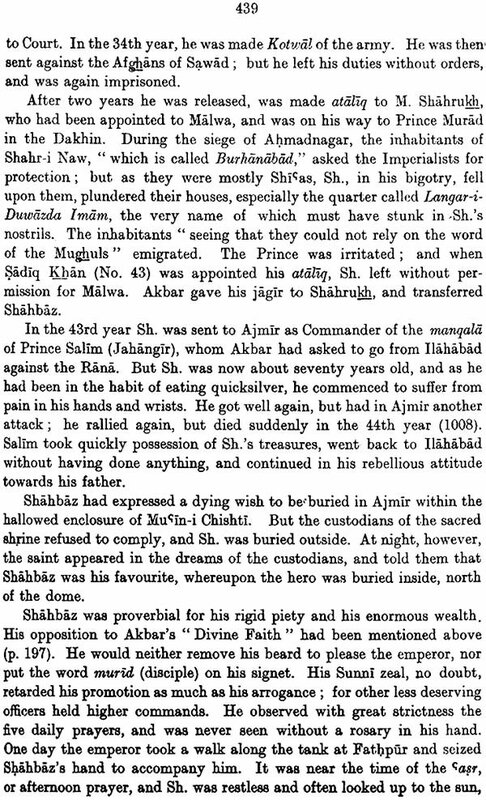 The enormous importance of the Ain-i-Akbari of Abu 'L - Fazl as a historical document of the Mughal period of Indian history needs no elaboration, In his preface to the first edition of the English translation of the book, written in 1873, H. Blochmann had described it as 'by far the greatest work in the whole series of Mohammedan histories of India'. That assessment of the book as a source material has not changed much inspite of the significant progress in historical research of medieval India. Thorough editing of a work of this nature needs profound scholarship and years of painstaking dedicated research. This is borne out by the fact that it had taken more than half a century to bring out a new edition with only minor editorial additions and changes. This is the first time that the Asiatic Society is bringing out the three volumes of Ain-i-Akbari in a single volume. We would have been happy if the book could be thoroughly re-edited in the light of the latest researches. That would have required much time besides versatile scholorship and dedicated single minded hard work and research. But the persistent demand from scholars for a handy volume of this great work has prompted the Society to publish the volume without waiting for an unknown period of time hoping for a new thoroughly revised edition. We hope the book will be welcomed by scholars as well as a wide circle of readers interested in one of the most fascinating periods of medieval India. The second book treats of the servants of the throne the military and civil services and the attendants at court who literary genius or musical skill receives a luster form the encouragement of the emperor and who in their turn reflect a brilliant light on the government. The third book is entirely devoted to regulations for the judicial and executive departments the establishment of a new and more practical era the survey of the land the tribal divisions and the rent roll of the great finance minister whose name has become proverbial in India. 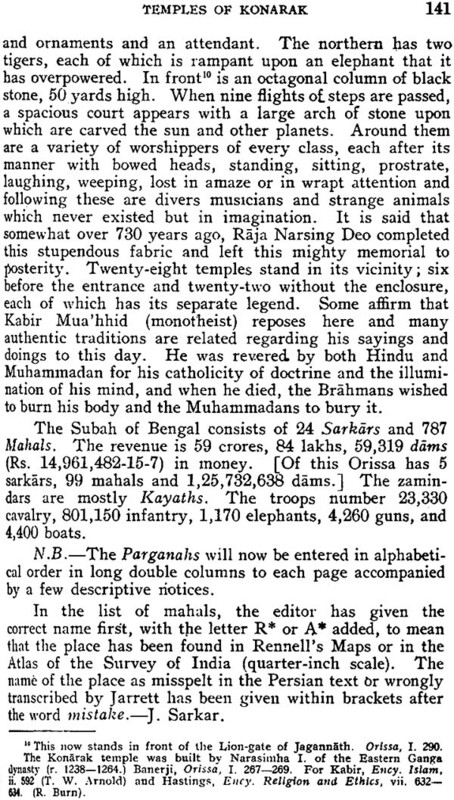 I am deeply indebted to the council of the philological committee of the Asiatic Society of Bengal for placing at my disposal a full critical apparatus of the A in and entrusting me with the edition of the text for which the Indian government had most liberally sanctioned the sum of five thousand Rupees. My grateful acknowledgements are also due to Dr. Thomas Oldham Superintendent of the Geological Survey of India and late president of the Asiatic Society for valuable advice and ever ready assistance in the execution of the work and to Col. H Yuel, C.B. and to H. Roberts Esq., of the Doveton college for useful hints and corrections. 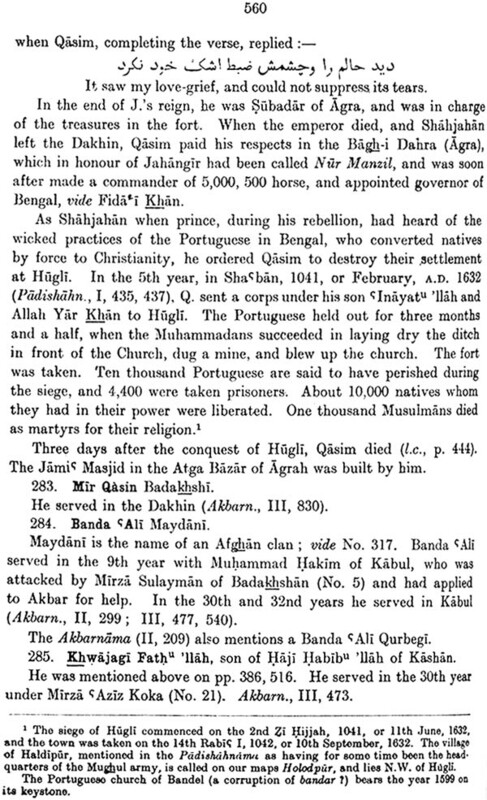 After the lamented death of H. Blochmann on 13th-July, 1878, at the early age of 40 years only, a search among his papers showed that he had not translated any portion of the Ain-i-Akbari beyond the first volume which the Asiatic Society of Bengal was then publishing, In fact, his careful editing of the vast text of the A in had been such a laborious task, and his English version of the first volume of it was such a monument of scholarship and tireless research in annotation, that he could not have had the time to begin the translation of the second volume. The Society entrusted his unfinished work to Lt.-Cot. H. S. Jarrett, who finished printing the translation of the second volume in 1891. 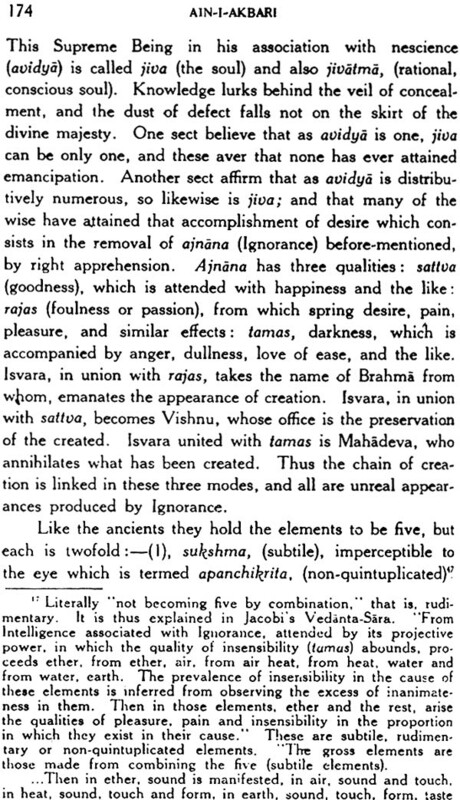 Thus, Jarrett had at his dispos-al only such works of reference and learned treatises on India as were in print in '1884- 1889. The authorities cited by him in his notes, as I have pointed out in the Introduction to my revised edition of the 3rd volume of his translation, have proved to be obsolete and often useless in the light of our knowledge today. Since 1890, a complete revolution in these branches of orientology and the history of Hindu and Muslim India has been effected by the publication of Hastings's Encyclopadia of Religion and Ethics, the Encyclopadia of Islam, the Grundriss of Buhler, Elliot and Dowson's History of India as told by its own Historians, the Cambridge History of India, and many learned monographs on particular sovereigns and dynasties by Indian writers which touch the high-water mark of modern critical scholarship and exhaustive research. All these authorities were unknown to Jarrett. 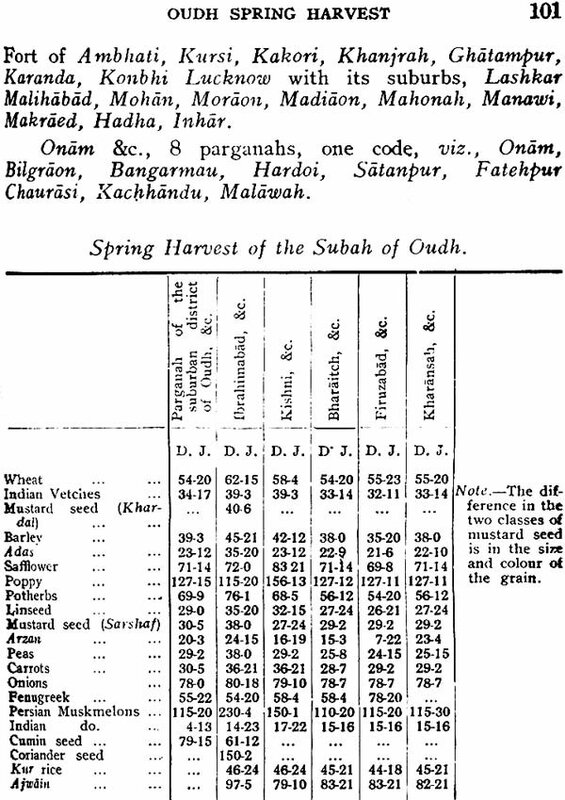 His sole resource for the Hindu dynastic lists was Prinsep's Useful Tables (published in 1832) which is often based on this very A in-i-A kbari and improved by reference to the mythical' Puranas (as summarised in Wilson's translation of the Vishnu Purana.) As for the Muslim rulers, he had to depend on the primitive History of India by Elphinstone (1841) or its source Firishta. 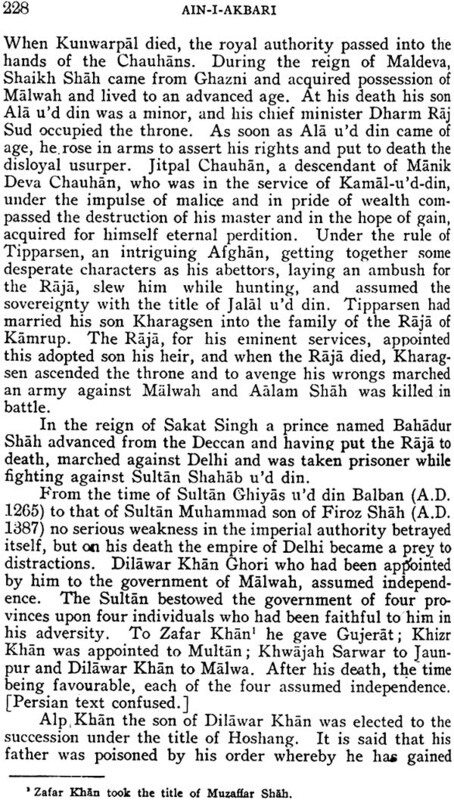 Our reconstruction of Indo-Muslim history from inscriptions, coins and .original Persian manuscripts was naturally missed by a writer of the years 1885-1889. Therefore a mere reprint of Jarrett's translation and notes today would not do justice to the present state of Oriental scholarship and would naturally disappoint the modern reader. Thus the first task of an editor of Jarrett's translation is to correct and modernise his notes and elucidations by sweeping away his heaps of dead leaves, and giving more accurate information from the latest authorities. My second aim has been to lighten the burden of his notes, many of which are not only obsolete in information,' but -prolix to the point of superfluity. It is, I think, a mistake of the translator's duty to try to make a modern reader get all his ideas of Hindu philosophy science, mythology, hagiography, and the topography and history 01 Muslim and Hindu India from the notes to an English translation of the Ain-i-Akbari. The modern reader will find very much fuller and far more accurate information on these subjects in the voluminous encyclopaedias, gazetteers and standard monographs published in the present century, which are available in the libraries of learned societies. I have also economised space and saved the reader from frequent unnecessary interruptions, by the omission of Jarrett's notes on the emendations of the printed Persian text made by him (except in a few cases of vital importance.) The numberless variant readings which encumbered the pages of his second volume have been mostly cleared away by the acceptance of the true forms in the body of the book and rejecting all those that are palpably wrong or unhelpful in solving our doubt. 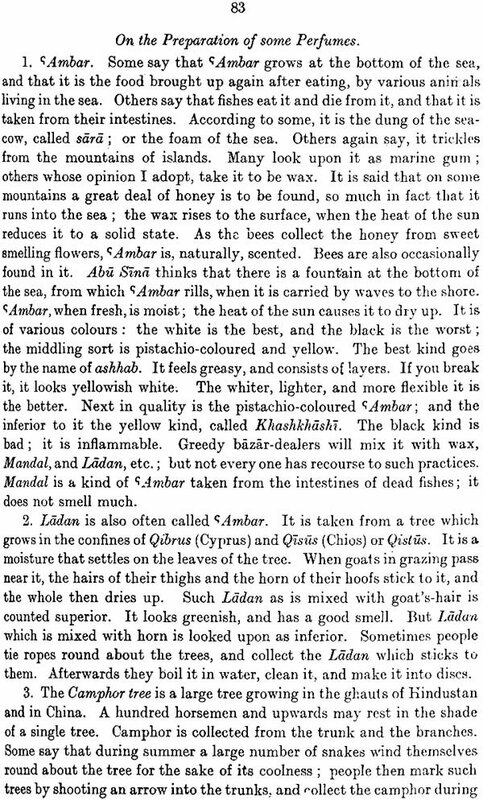 It is well-known to the learned world that the editing of many of the volumes in the Persian and Arabic section of the Bibliotheca Indica series, was not done with the care and accuracy which characterise the oriental texts published in London or Paris, Leyden or Beyrut, Therefore all obvious misprints and wrong readings in the text of the Ain have been silently correctd in this revised edition of the translation, and many hundreds of notes of the first edition deleted. 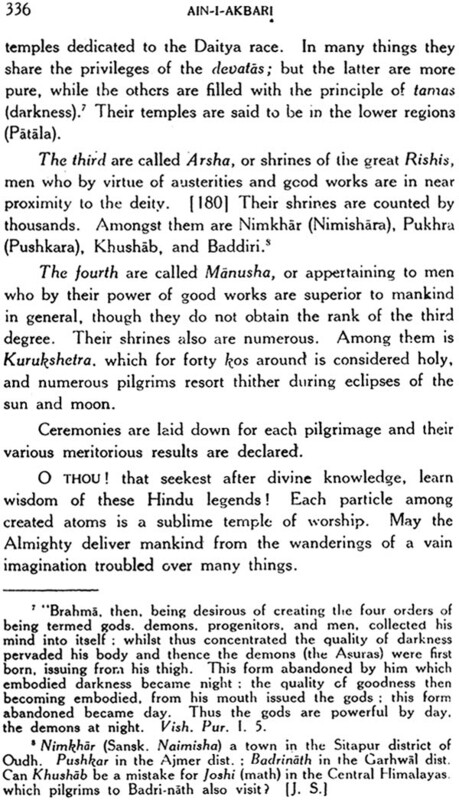 The third volume of the A in-i-A kbari is an encyclopaedia of the religion, philosophy and sciences of the Hindus, preceded by the chronology and cosmography of the Muslims, as required by literary convention, for comparison with the Hindu ideas on the same subjects. 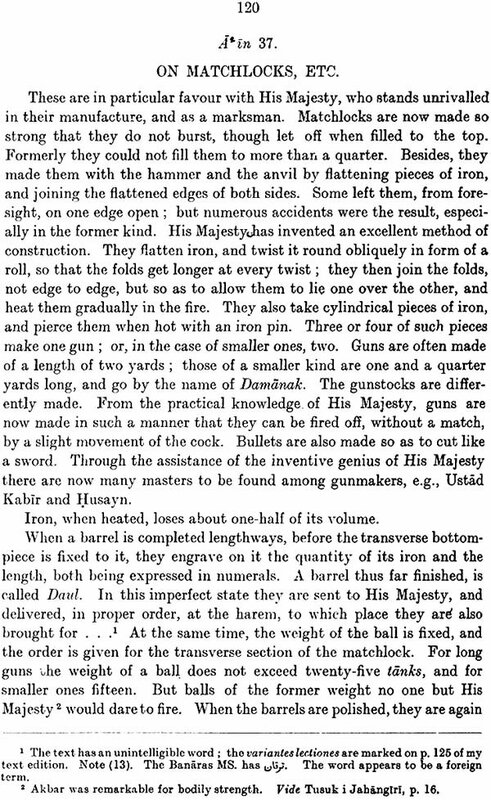 The second volume was designed to serve as a Gazetteer of the Mughal Empire under Akbar. 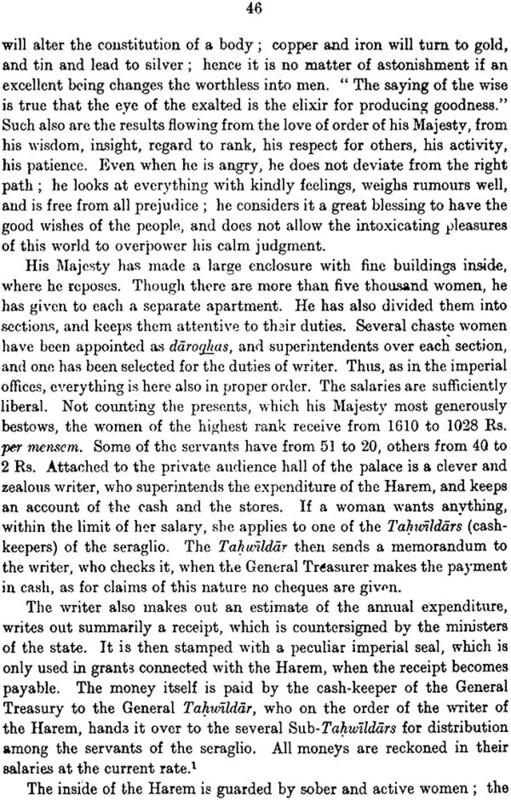 Its value lies in its minute topographical descriptions and statistics about numberless small places and its survey of the Empire's finances, trade and industry, castes and tribes. Jarrett's translation of Volume II is weakest in this essential respect. 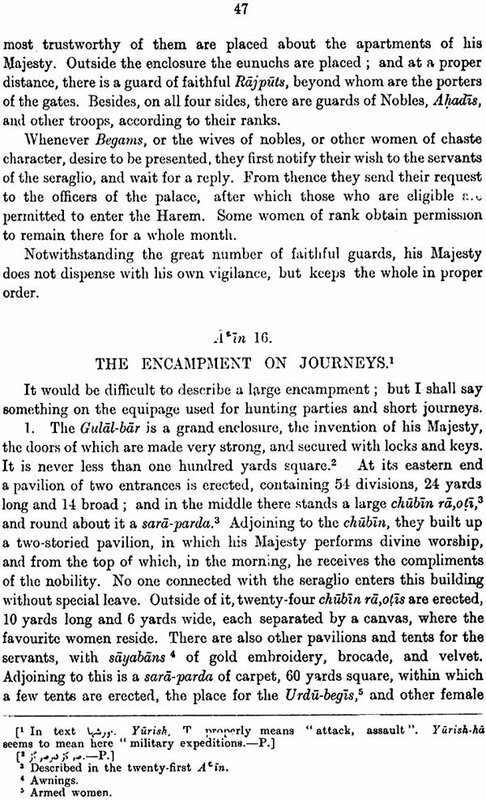 For the more than six thousand place-names in this volume he could consult only Hunter's Imperial 'Gazetteer of India (in the rather crude early edition of 1887) ; but that work is quite unhelpful for the purpose of identifying the minute places mentioned in the Ain, and its volume of maps is on too small a scale to give the information we need. The highly useful and detailed provincial Gazetteers=-such as Atkinson's N. W. P. Gazetteer and Campbell's Bombay Gazetteer, were completed after the Eighteen-eighties, too late for Jarrett's use. 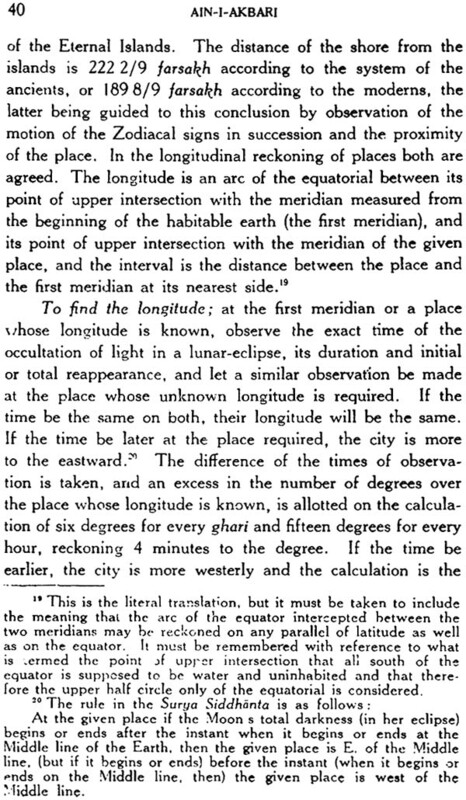 N or did he consult the quarter-inch-to the mile maps of India published by the Surveyor-General and entitled the Indian Atlas. These two authorities,-the provincial Gazetteers and the Survey maps-are indispensably necessary for correctly tracing the place-names in the A in-i-Akbari. 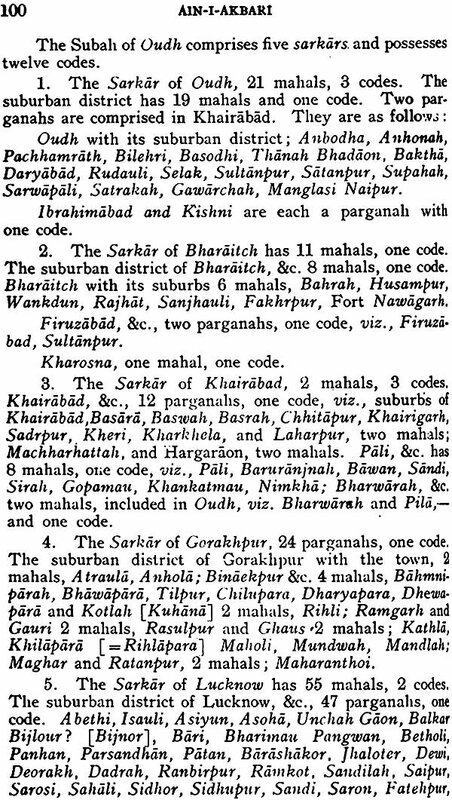 I have consulted these two primary works of reference and corrected Jarrett's (or Abul Fazl's) names and notes, with infinite labour, the nature of which can be understood only by comparing the list of mahals in a district (sarkar) in Jarrett's edition with the corresponding page in mine. Nine-tenths of the place-names in this book have been identified and entered in the corrected spelling in the course of my revision. This improvement of Abul Fazl's work will be completed and the nature of the gain to our knowledge of Mughal Indian topography will become evident to the modern reader, after the publication of a supplementary volume, on which Prof. Nirod Bhusan Roy is now working and which will contain a very much enlarged geographical index giving the location and exact references to mapsheets and Gazetteer-pages for each place mentioned here and discussing the probable location or necessary emendation of the small proportion of places not satisfactorily traced by me. Very many of the mistakes in Jarrett (or rather m the printed Persian text followed by him) were due to the wrong placing or omission of dots (nuqta) and the well-known confusion of certain letters of the Arabic alphabet by our copyists. These I have Silently corrected. 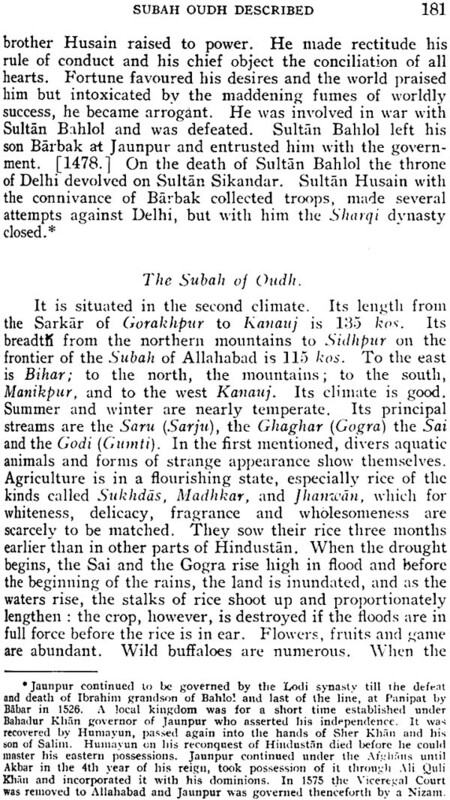 The chapter on the subah of Kashmir, which was the most confused and wrongly spelt in this volume,-has. 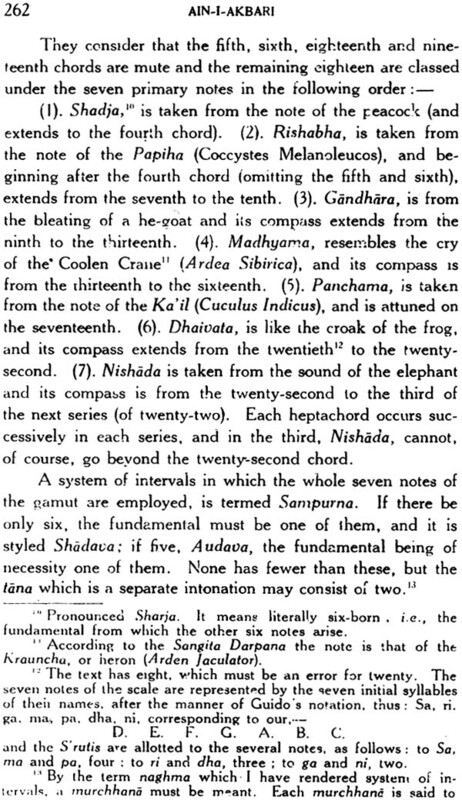 been revised throughout by Professor Nirod Bhusan Roy, on the basis of Stein’s M emoir and Chronicle of the Kings and the official Gazetteer (by Bates). But the necessary changes are so many that the .new information has been lumped together at the end, instead of being distributed in countless footnotes on the respective pages, and the useless notes and extracts of the first edition have been omitted. I am deeply obliged to Prof. N. B. Roy for the care and persistence with which he has assisted me in this work of revision and performed the exacting task of reading the proofs (up to p. 192) of such a difficult book. A special word of thanks is due to the Sri Gouranga Press, which has patiently and efficiently done the rather exasperating work of printing this volume from a copy of the first edition, whose rotten paper crumbled at the touch, and on which my ink corrections had made the text even less readable than before. The sight of this press copy had scared away two first-rate printing establishments in Calcutta to whom it was previously offered, and the acceptance of the work of printing it was really a favour shown to the Society and to learning, by the Sri Gouranga Press. For my appreciation of the man nee in which, 011 the whole, Jarrett completed a stupendous task, I refer the reader to my Introduction to the Translation of the Third Volume of the A in, 2nd edition. The absence of uniformity in the transliteration of oriental words in the Roman alphabet, is explained by the facts, (1) that Jarrett himself did not follow one uniform system throughout the first edition printed by him, (2) that the rotten paper of tile. single copy of this first edition which was given to me for preparing my press-copy, made it impossible for me to erase wrong marks and insert the latest- current signs in most places, and (3) that the typing of the entire book and the insertion of diacritical marks uniformly according to the system at present followed by the Society, could not be carried out for financial reasons. 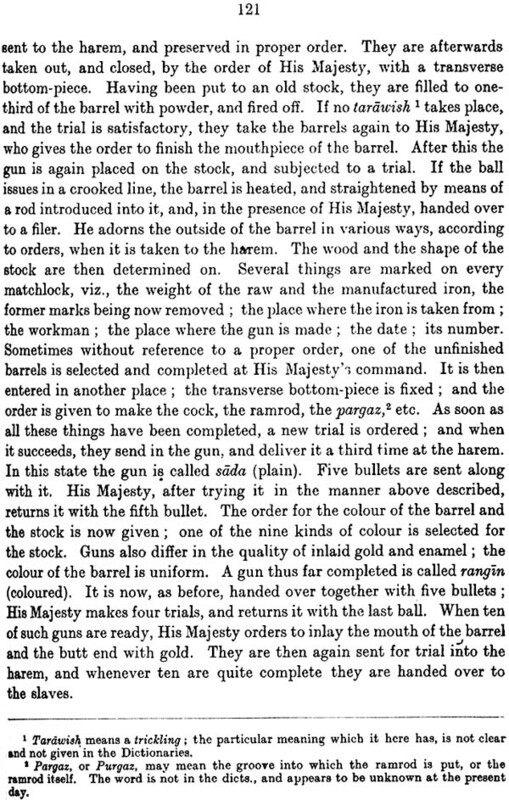 In short, this edition had to be printed in the rough practical form that I have given to it, or not at all. But two little hints may be given here: in the unchanged portions of Jarrett's work the inverted comma stands for the letter aliph (in names like-ud-din), while in my portion it stands for the letter "ain ; and the mark over the long A (capital) could not be inserted owing to some technical difficulty in linotype composition. 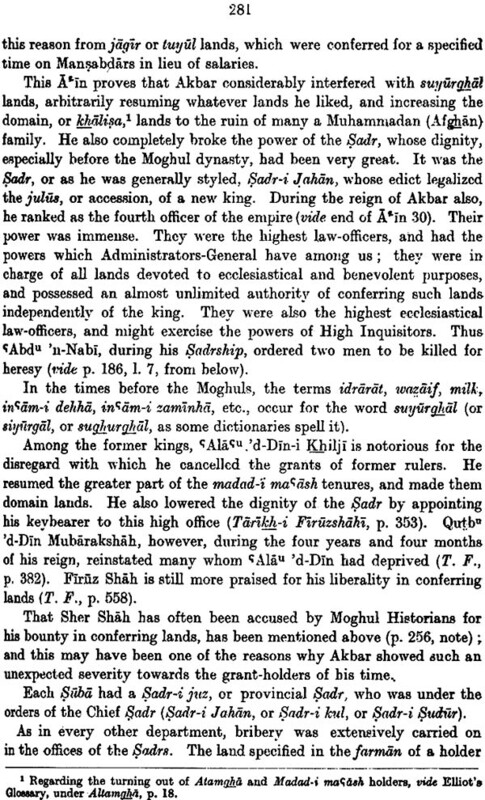 Colonel Jarrett’s English translation of the Ain-i-Akbari Vol. III. Has been long our to print though there is always a demand for it and second hand copies are now selling at fancy prices. But a mere reprint of his edition would not do justice to the present state of Oriental scholarship and would naturally disappoint the modern reader. Jarrett began the preparation of his translation about 1890 that is fully 57 years ago. Among the authorities he most frequently quotes in his notes are D’Herbelot’s Bibliotheque Orientale (1697 A.D.) D. Ohsson’s Historic des Mongols (1834) De Guignes’s Histoire general des Huns (1756) Max Mullers’ History of Sanskrit Literature (1859) Davies’s Hindu philosophy Colebrooke’s Essays (1805-37) and Elphinstone History of India (1841).